Water Clarity 0 to 2 ft The Fishing really has picked up in the last week with better numbers and larger fish. In the last few guided trips I had a kid catch his first fish ever and another catch his biggest limit. Fish range from 3 1/2 to 5 1/2 pounds. On Saturday we had a 22 1/2 lb limit and over 20 fish in a 6 hour day fishing with soft plastics and some reaction baits. I fished both the north and south end. In the south the algae is thick at the launch ramp but I was able to fish in cleaner water all week. I found the fish to be grouped up and most of the spots we fished we could catch a bunch of them if we had patience and stayed on them. Tips.. Fish slow, most of the bites are soft or just pressure. 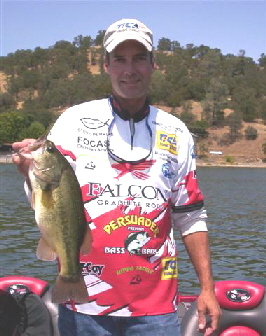 Use your electronics to find bait and fish, If you find the bait the fish are close by. For the shallow bite flip the weed and shade pockets or throw the Frog. For deep fish keep an eye on your graph.